The JDSU Protocol Analysis Probe – DNA PRO (J6803B) is a portable protocol acquisition and analysis solution, with an embedded PC and integrated Network Analyzer software application. The DNA PRO includes data acquisition hardware and accommodates line interface modules (LIMs). The JDSU Protocol Analysis Probe – DNA PRO (J6803B) offers the most advanced feature set in the DNA portfolio. You can control the analyzer from a PC, locally or remotely. 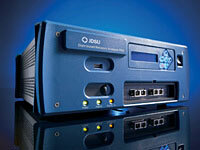 The analyzer hosts the J6840A Network Analyzer for full protocol analysis and network testing. It supports Run-Time Store to Media (RTSM) up to 150 Mbps. Like the DNA MX, Network Analyzer is accessed using a remote session. The hardware includes a built-in controller and a removable hard disk drive. The use model of the DNA PRO is as a portable analyzer for local or remote troubleshooting.